During the 1980 summer, Billy, looking for the right combination to win the championship, tried to hit a home-run by bringing in Milano the number 3 player from the NBA draft, Kevin McHale. 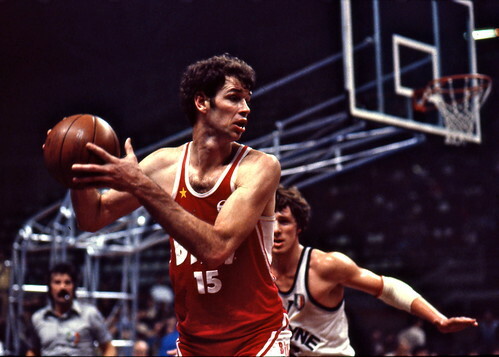 Traded for Joe Barry Carroll, another future Milano’s player, McHale was struggling to find an agreement with the Boston Celtics and came to Milano to force the issue. At the last minute, the Celtics made their move bringing him back to the States. With one week to go before the start of the season, Coach Peterson pick a veteran player, John Gianelli, a power forward more than a center, educated hands, very smart, defensive-oriented. He was criticized early. He used to play showing no emotions and was nicknamed “Pisolo”, “Sleepy”. By reading his Milano’s numbers would be very easy to form a different opinion. In three seasons, Gianelli averaged more than 16 points per game and during the first two seasons he also grabbed more than 12 rebounds per game. His shooting percentages went up every single season. During the 1981-82 season, the championship year, he averaged 39.1 minutes per game. He was also the guy making the decisive block on Mike Sylvester clinching the title against Pesaro. He stayed one more year, played the Champions Cup final, losing by one point against Cantù. Maybe he was one of the greatest and still most underrated American players in Olimpia’s history. Born in 1950, he was a Californian of Italian blood, had a spectacular college career at Pacific, and went on to play in the NBA, earning a rotation spot with the New York Knicks winning the 1973 championship along Bill Bradley. In 1976 he was one of the players traded to Buffalo for McAdoo, confirming the sequence of coincidences linked to Olimpia, from McHale-Carroll to Bradley and McAdoo.